Figure A. RPE conjugated rat anti mouse CD4 (MCA2691PE). Figure B. RPE conjugated rat anti mouse CD4 (MCA2691PE) and A488 conjugated mouse anti mouse CD90 (MCA02A488). All experiments performed on red cell lysed murine splenocytes gated on mononuclear cells. Data acquired on the ZE5™ cell analyzer. Figure A. RPE conjugated rat anti mouse CD4 (MCA2691PE) and A647 conjugated mouse IgM isotype control (MCA722A647). Figure B. RPE conjugated rat anti mouse CD4 (MCA2691PE) and A647 conjugated mouse anti mouse CD90 (MCA02A647). All experiments performed on red cell lysed murine splenocytes gated on mononuclear cells. Data acquired on the ZE5™ cell analyzer. 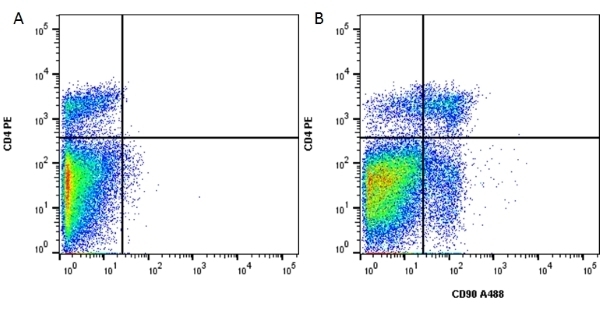 Mouse anti Mouse CD90 antibody, clone F7D5 (MCA02R) used for T cell depletion of bone marrow and subsequent evaluation of chimerism by flow cytometry. From: Gobin V, Van Steendam K, Fevery S, Tilleman K, Billiau AD, Denys D, Deforce DL. Fluoxetine reduces murine graft-versus-host disease by induction of T cell immunosuppression. J Neuroimmune Pharmacol. 2013 Sep;8(4):934-43. Mouse anti Mouse CD90 antibody, clone F7D5 recognizes the mouse Thy1.2 alloantigen, also known as CD90.2, which is expressed by thymocytes and peripheral T lymphocytes. Clone F7D5 reacts with Thy1.2 mice such as CBA and BALB/C, but not with Thy1.1 mice eg. AKR and FUB. The antibody is particularly useful for removal of T lymphocytes from cell populations by complement mediated cytotoxicity (Lake et al. 1979). 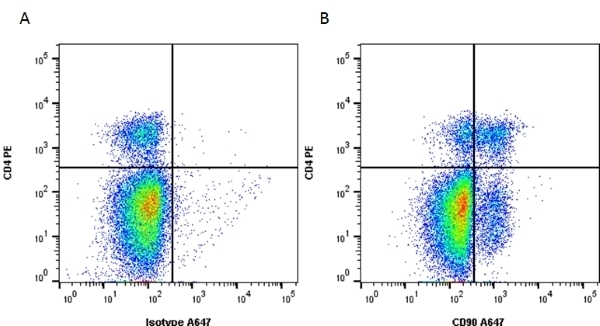 Mouse anti Mouse CD90 antibody, clone F7D5 is routinely tested in flow cytometry using mouse thymocytes. Spleen cells from immunised AKR mice were fused with cells of the mouse NS-1 myeloma cell line. Lake, P. et al. (1979) Production and characterization of cytotoxic Thy-1 antibody-secreting hybrid cell lines. Detection of T cell subsets. Eur J Immunol. 9 (11): 875-86. Yoshida, K. et al. (2002) Evidence for shared recognition of a peptide ligand by a diverse panel of non-obese diabetic mice-derived, islet-specific, diabetogenic T cell clones. Int Immunol. 14 (12): 1439-47. DeVries-vanDerZwan, A. et al. (1997) Specific tolerance induction and transplantation: a single-day protocol. Winzeler, A.M. et al. (2011) The lipid sulfatide is a novel myelin-associated inhibitor of CNS axon outgrowth. Unterlauft, J.D. et al. (2014) Enhanced survival of retinal ganglion cells is mediated by Müller glial cell-derived PEDF. Exp Eye Res. 127: 206-14. Brown, R.L. et al. (2015) TRPM3 Expression in Mouse Retina. Hanafusa, T. et al. (1988) Induction of insulitis by adoptive transfer with L3T4+Lyt2- T-lymphocytes in T-lymphocyte-depleted NOD mice. Billiau, A.D. et al. (2003) Transient expansion of Mac1+Ly6-G+Ly6-C+ early myeloid cells with suppressor activity in spleens of murine radiation marrow chimeras: possible implications for the graft-versus-host and graft-versus-leukemia reactivity of donor lymphocyte infusions. Raeber, A.J. et al. (1999) PrP-dependent association of prions with splenic but not circulating lymphocytes of scrapie-infected mice. Wang, X. et al. (2001) Functional soluble CD100/Sema4D released from activated lymphocytes: possible role in normal and pathologic immune responses. Billiau, A.D. et al. (2002) Crucial role of timing of donor lymphocyte infusion in generating dissociated graft-versus-host and graft-versus-leukemia responses in mice receiving allogeneic bone marrow transplants. Ishikawa, N. et al. (1998) Early cytokine responses during intestinal parasitic infections. Ishigaki, H. et al. (2006) Preparation and functional analysis of tumor-infiltrating stroma cells using bone marrow chimera mice. Microbiol Immunol. 50 (8): 655-62. Logan, G.J. et al. (2004) CD4 expression on EL4 cells as an epiphenomenon of retroviral transduction and selection. Immunol Cell Biol. 82 (2): 132-5. Gobin, V. et al. (2013) Fluoxetine reduces murine graft-versus-host disease by induction of T cell immunosuppression. J Neuroimmune Pharmacol. 8 (4): 934-43.
van Pel, M. et al. (2003) Towards a myeloablative regimen with clinical potential: I. Treosulfan conditioning and bone marrow transplantation allow induction of donor-specific tolerance for skin grafts across full MHC barriers. Bone Marrow Transplant. 32 (1): 15-22. Oosterwegel, M.A. et al. (1999) The role of CTLA-4 in regulating Th2 differentiation. J Immunol. 163 (5): 2634-9. Vadivelu, S. et al. (2015) NG2+ Progenitors Derived From Embryonic Stem Cells Penetrate Glial Scar and Promote Axonal Outgrowth Into White Matter After Spinal Cord Injury. Stem Cells Transl Med. pii: sctm.2014-0107. Wang, Y.L. et al. (2015) Electrospun and woven silk fibroin/poly(lactic-co-glycolic acid) nerve guidance conduits for repairing peripheral nerve injury. Neural Regen Res. 10 (10): 1635-42. Liu, X. et al. (2017) Thy-1 interaction with Fas in lipid rafts regulates fibroblast apoptosis and lung injury resolution. Naaldijk, Y. et al. (2016) Effect of systemic transplantation of bone marrow-derived mesenchymal stem cells on neuropathology markers in APP/PS1 Alzheimer mice. Bernard-Marissal, N. et al. (2015) Dysfunction in endoplasmic reticulum-mitochondria crosstalk underlies SIGMAR1 loss of function mediated motor neuron degeneration. Brain. 138 (Pt 4): 875-90. Takahama, S. et al. (2017) Retinal Astrocytes and GABAergic Wide-Field Amacrine Cells Express PDGFRα: Connection to Retinal Ganglion Cell Neuroprotection by PDGF-AA. Invest Ophthalmol Vis Sci. 58 (11): 4703-11.